We were recently doing some minor repairs to a set of front concrete stairs when they suddenly and inexplicably collapsed into a pile of rubble in front of the home. After overcoming my initial dismay, I began to consider what might have caused this dramatic event. 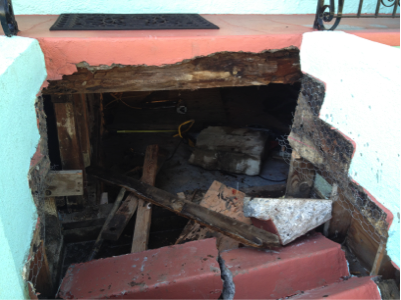 If this were to have happened when the homeowner was entering the house they could have been seriously injured. From above and below the stairs appeared to be in reasonable condition. On closer inspection it was clear the concrete steps had been patched in the past, allowing water to get into the support framing. The only waterproofing under the old concrete protecting the framing was building paper (tar paper), which has a limited lifespan when it is in frequent contact with moisture. Since the old concrete had no steel reinforcing (rebar), once it settled due to the poor support framing it actually broke up into several smaller pieces. The wood form material underneath the stairs concealed this cracking. Because of a lack of proper flashing where the steps met the stucco sidewalls, water got into the walls and rotted the studs. This framing made up the structure supporting the steps, but it was also concealed by the stucco. All it took was the removal of one 2×4 and the whole thing came crashing down. If you figure at least a couple of cubic yards of material you are looking at approximately 10,000 pounds of concrete!!!! Front stair and landing replacements are becoming a significant part of our work, and with good reason. This dramatic collapse shows what can happen when the damage is severe, and why it might go unnoticed. With older concrete structures that show signs distress one should make test openings in the stucco and the support framing to look closely at their condition. If they are in poor shape it might make sense to consider replacing the whole structure. Sometimes new foundation work is required, but not necessarily. 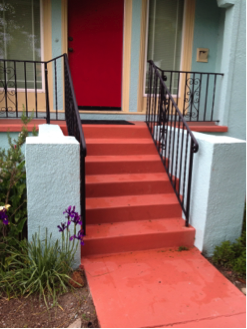 We would demo the existing concrete steps and support framing and replace the wood with new pressure-treated material, usually of a bigger dimension and with narrower spacing. This usually requires some detailing from our structural engineer to design the supports to modern engineering standards. On top of the framing we use pressure-treated plywood and then a bituthene roofing membrane for waterproofing, along with metal flashing at the sides adjacent to the wall framing. The final step is the steel-reinforcing for the new concrete. The end product is a much more supportive structure which will provide a safe entrance to your home for many more years to come.